Another eye-catching mitered design in super soft, superwash Merino 6! 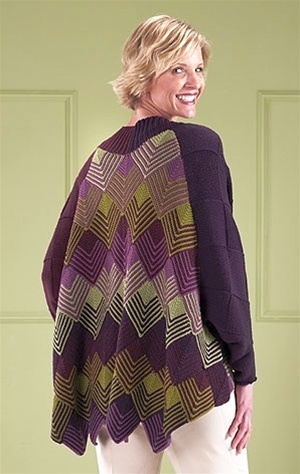 This pretty jacket features a front closure and the large miter motif on the back. The colors are combined in an interesting sequence that results in a complicated pattern from simple knitting. Easy and quick knitting. Choose your own color combination to coordinate with the rest of your wardrobe.